Retrace age old paths and take more than a leaf out of the history books with a visit to Beamish Open Air Museum when House Sitting in the North East of England. This vibrant and lively museum, situated in picturesque County Durham, is only 12 miles North West of historic Durham City and 8 miles south west of Newcastle upon Tyne. Set in 300 acres of varying and beautiful terrain you will find yourself transported back to Georgian, Victorian and Edwardian times for a life sized and interactive experience. Beamish Open Air Museum opened in 1972 and has received many awards over the years. Their attention to detail and passion to preserve typical scenes from everyday life in the past is astounding. The 300 acre site has a mixture of relocated, original and replica buildings, artifacts, working vehicles and equipment. All sections of the museum have been painstakingly restored and brought back to life to help educate and enthral visitors to the centre. The museum was set up to preserve the heritage and historical past of the north area of the UK, conserve local rare breed farm animals and provide a safe and enjoyable experience for visitors. Many of the items that can be seen on site were donated willingly by local people and there are currently over 304,000 pieces of history that can be seen. From a full railway station and buildings that were moved from other local areas and recreated at Beamish, to Victorian shops, a schoolhouse and even an old fashioned coal mine. With so much to see it’s worth spending a whole day at Beamish Open Air Museum. Getting there is easy by car or public transport and parking is free within the centre. The museum offers facilities for all ages and has a wide range of food and drinks available on site including an old fashioned sweet shop and licensed public house. More information on Beamish Open Air Museum can be found on their website Here. The vast amount of attractions, historical and educational pieces plus regular fun events bring approximately 350,000 visitors a year to the museum. Short courses are available in many heritage crafts such as bee keeping, pottery, felt making and driving a steam engine and there are also seasonal activities for you to enjoy and learn from. Costumed staff are present to assist with any questions you might have and the whole museum offers a unique day out. Over the last 40 years Beamish Open Air Museum has gone from strength to strength and entertained some very important visitors. What will come of the next 40 years is hard to say, but Beamish Museum is set firmly in the minds and hearts of the local people who hope it will continue to grow and preserve their heritage for many years to come. In 2013 there are new attractions due to open and more chances to learn about almost forgotten era’s, products and crafts than ever before. 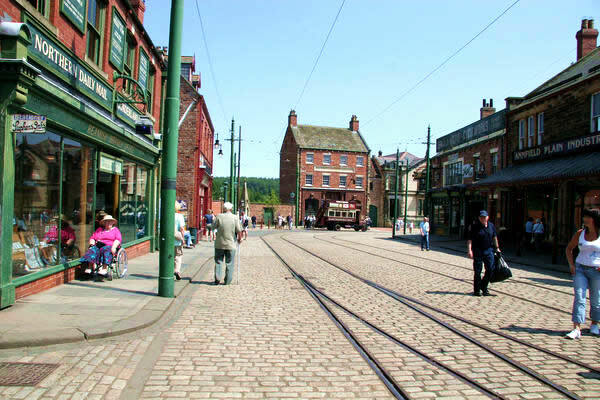 Take a walk down memory lane with Beamish Open Air Museum and live the past through their eyes and vision.